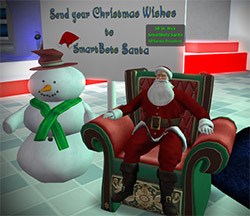 Santa joins SmartBots for Christmas! Christmas is all about love and happiness! SmartBots host a VERY special guest for this Christmas! IM Santa what do you think of SmartBots and what are your wishes this year. You can sit in Santa’s lap and do some screenshots, too! Open your heart to Santa, he loves it! SantaBot is smarter than every other bot – he randomly picks his chosen one. Make sure you’re openhearted with Santa when messaging him! If chosen, we will contact you in Second Life. We believe that nobody should be left without presents on such wonderful holiday! Stick around and subscribe to our blog – we will announce Santa’s chosen ones by New Year’s Eve! Teleport to Santa now!